One of the great "mysteries" of D&D lore that I recall from my youth was a cryptic statement by Gygax in an article of his in Dragon. He was discussing the then-theoretical revision of -- what would become 2e years later -- and he commented that, among the few things he'd be changing in the revised Players Handbook was the weapons table, because he'd inadvertently left out a very common medieval weapon and he wished to rectify this omission. For years, I could never figure out what Gary was alluding to. After all, the 1e PHB includes every polearm under the sun. What could he possibly have left out? I eventually realized that, in all likelihood -- someone can correct me if Gary said otherwise before his death -- he was referring to firearms. Anyone who's studied medieval military history will know that firearms of various sorts, cannon, and explosives (like the petard of "hoist on your own petard" fame) were widely used in the late Middle Ages. They might not have been as common as they are today, but, from the late 13th century onward, they played an increasingly prominent role in warfare. For some reason, fantasy roleplaying has generally been down on the inclusion of firearms. Tunnels & Trolls, I recall, included them (as did Blackmoor), but it's always been an outlier in that regard. Firearms are usually seen as the thin end of a technological edge that throws off the equilibrium of many fantasy settings. I rather like the esthetic of archaic firearms and plan to include them in my next campaign. While pondering the subject this week, I had occasion to open a page of Supplement I to OD&D and discovered, on page 14, at the very end of the weapon vs. AC table an entry line for the arquebus. So far as I can find there are no other details of the arquebus anywhere in the official OD&D books (not even Greyhawk), but it emboldened me in my belief that primitive firearms aren't alien to the game. I'll probably offer my rules and stats for them in an upcoming Grognard's Grimoire. Cannon and arquebuses were present in Chainmail and specifically excluded (except for that single stray reference in Supp I) from D&D, and Gygax had several essays about how he thought firearms and D&D were a bad mix, so I very much doubt he would've added them back in (even though TSR did -- AD&D 2E includes the arquebus on the weapon-list). More likely I think the mysterious "missing weapon" was either the maul or the pole axe (both of which, incidentally, turned up in the weapon-lists in Dangerous Journeys (alongside many other weapons that weren't included in AD&D, so that itself isn't necessarily evidence of anything). "Gygax had several essays about how he thought firearms and D&D were a bad mix"
A look at D&D's primary literary inspirations doesn't turn up much gunpower, so I'm tempted to side with him there. Could also have been the Rapier or Small Sword. I think there's a bit of controversy as to when firearms were introduced into medieval warfare, but Seward has a reasonable claim that Edward III had them at Crecy in 1346 (probably would have been "organ guns" as per Seward; I'm not sure how much use the English made of these beyond Crecy or if they went to more generic light artillery). I certainly think that the implied milieu, with its fancy polearms and fancy armor, can arguably be situated in the HYW period. By the end of this (roughly one century, obviously) period we see light artillery, heavy artillery ("bombards"), organ guns and handgunners. 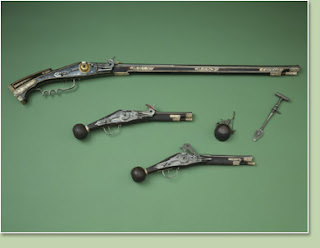 The arquebus itself might be a bit late for the period we're talking about, but I think a hand culverin would fit right in. And who doesn't want to bring a cannon to bear on a dragon? Mention of the arquebus from the to-hit modifiers in Greyhawk jogged my memory--I think a full set of stats for the arquebus may have been included in the Judges Guild Dungeon Tac Cards. I think black powder firearms are also in a couple other "old school" games, namely High Fantasy and possibly Fantasy Wargaming. I agree that they give a very different tenor to the fantasy setting--not unwelcome, but not what I think of as either S&S or "high fantasy". If anything, it's a darker feel, reminding me of Drürer & Bosch, the age of religious wars, witchcraft, and the Inquisition. This cannon idea intrigues me and I wish to learn more. Also, more cannon=better pirates=awesomer world. Which of course brings up that Warhammer Fantasy Roleplay was another fantasy rpg that included firearms. The peculiar prejudice against firearms in fantasy extends well beyond RPGs and into a lot of literature, where it's even more inexplicable. I was reading Empire in Black and Gold recently, and that's set in a world which includes trains, flying machines and factories yet *still* doesn't include firearms. China Mieville's New Crozubon novels are similar: they're set in a very modern world but for some reason there's still no actual *guns*. I think there's a couple of reasons for it. In RPGs I think game balance is tricky. If guns are better than bows, no PC will use a bow, if they're worse, no PC will use a gun, if they're different-but-equivalent, you've just needlessly complicated your combat system. In fantasy, I'm not sure, but I think there's a finality about a gunshot which doesn't fit a lot of settings. We can just about accept Sean Bean fighting on with a dozen arrows sticking in him, but we'd balk at his surviving an equivalent number of bullets. A lot of fantasy is still based on derring-do and swordfighting, and the moment you add "or we could just shoot him" as an option, a lot of that goes out the window. bah. Rams, Greek fire, catapults and barrels of naphtha, all in the 5th century. Beat that. I assume you haven't read the account of Edward Teach's death in Robberies and Murders of the Most Notorious Pyrates. The man is described as fighting on while riddled with bullet holes and with a couple of swords sticking out of him. Granted, it's excitable fiction, but why not? China Mieville is a good example, but I was thinking more of the stuff that inspired D&D more directly. Did Conan employ a gun? Fafhrd and the Mouser? Elric? The wizards on Dying Earth? Even Tolkein, if you want to count him, put no guns in Middle Earth. John Carter of Mars? Okay, I'll give you that one. But by and large? my belief that primitive firearms aren't alien to the game. They aren't. More than that - do you remember "Mars-in-rules" in 3LBB, James? I'm, recently using six-shot guns (very rare things of course) and seriously thinking about rad pistols. I was going to write something about gunpowder heralding a paradigm shift in warfare that destabilized the old ways of defense and thus would confuse the standard tropes of D&D, but then I realized something that makes me wonder if gunpowder would ever be invented in D&D anyway. Magic completely supplants gunpowder. Anyone intelligent enough to develop gunpowder could handle spells that would trump it. Secondly, if anyone developed something like that, mages would rush to destroy all traces of it, just to keep themselves on top. The 'common people' shouldn't be able to equate a mage's power just by going out and buying a gun. I've always sorta taken magic to be the reason that technology never develops in D&D worlds. Many of them have this history with thousands of years of civilization, but they are still in the medieval era. I say mages, and the ability of magic to overcome the challenges that technology solves in the real world, keep it that way. The "magic trumps tech" theory only really works if you assume a D&D world which is actively, directly ruled by mages who control their holdings by direct magical coercion. Works fine for Thay, doesn't work for Blackmoor. Otherwise, no matter how good magic is, guns are going to have the advantage that you can outfit your entire army with the things, whereas unless you're playing silly buggers with the game mechanics ("I'll just get all my peasants to multiclass to Wizard!") your access to powerful spellcasting is strictly limited. I agree that they give a very different tenor to the fantasy setting--not unwelcome, but not what I think of as either S&S or "high fantasy". That's the issue I have with firearms as well: they do change the tone of things. I console myself with the knowledge that Blackmoor has long had firearms as part of its setting and you can't get much more old school than that. They might not be "Gygaxian," but Gygaxian isn't the only flavor of OD&D. If guns are better than bows, no PC will use a bow, if they're worse, no PC will use a gun, if they're different-but-equivalent, you've just needlessly complicated your combat system. Indeed. For me, these are very important questions. I think, though, that it might be possible to include firearms in a way that makes them feel different without adding too much complexity, so that the choice of using a gun over a bow is much like the choice of using an axe rather than a sword. By and large, no, which is why I am coming round to the notion that maybe they don't have a place in most OD&D campaigns. At the same time, I can't shake the feeling that pulp fantasy is such a resilient and flexible medium for roleplaying precisely because, unlike other forms of fantasy, it can absorb lots of stuff that isn't native to it and reinterpret it ways that allow it to co-exist side by side with those native elements. More than that - do you remember "Mars-in-rules" in 3LBB, James? Indeed I do. I think a lot of people treat guns in D&D the same way they treat more explicitly science fictional elements in D&D. They're coming at it from a very staid interpretation of the game's sources and inspirations and filtering out any discordant influences that don't fit that interpretation. That doesn't give enough credit to the genius of the game. There could be many paths to power. Some are more effective than others, each with it's pros and cons; but for each of these paths, there should be something to offset them. Just throwing stuff out there, perhaps magic use bears an ultimate price (No resurrections, as their 'soul' has been claimed by magic?). Technology is really no worse than advanced magics (Can you say Wish, Permanency or Sphere of Annihilation?). Overusing ANYTHING is the unbalancing factor. Mais non! The fundamental problems with legions of MUs are (a) the rate of fire and (b) the unit cost of an MU, into whom you have to pour thousands and thousands of GPs before he's any use. An early hand cannon may take a couple of minutes to reload, a low-level MU takes hours. IIRC the fundamental reason anyone bothered with small battlefield firearms in the early days was the low cost and short lead-time for training, compared with raising large numbers of effective archers. Fireball more or less combines the killing power of WW1 artillery with the range of an arquebus, but how many of those can your army support? I don't think it would be very difficult at all. Just stick to early black powder weapons...low reliability, low rate of fire, but high damage and (either via special rule or applied weapon vs. armor modifiers) relatively effective against armor. You could also make them the exclusive province of a new class, which how High Fantasy handled them--Alchemists can use gunpowder as well as make poisons and potions. BTW I was wrong about the Dungeon Tac Cards including an arquebus...but now I'm pretty sure that The Fantasy Trip had some primitive black powder weapons. In OD&D doesn't matter what damage weapon do. All guns are d6. End of topic. Rate of fire - let say 2-3 shots / round. Who cares - it all depends on situationism/narration or character abilities - common sense nothing more. And all this moaning: "who invented powder?" or "army of kobolds with guns" or "it can destabilize balance of game". OD&D haven't balance at all, ppl! In my campaign was something like astronomical phenomenon - opening the hyperspace way from Mars to Earth. Pulpish? Yes - OD&D is Pulpish. If you look at 3LBB, you will see ROBOTS and ANDROIDS in Vol. II! All guns, lasers, bots are alien to Earth and very, very rare - that's simpliest answer and way of play. Who cares from where or by whom powder was made... Unknown, unpredictable, no strictly fantasy genre - that's essence of OD&D. Who's moaning? I actually liked the idea of a troop of Kobold with Hawken Guns. I still think it'd be funny watching the recoil blast them back and would probably have a darn good reason for such an encounter to happen in my game, but I still like it. I surely wouldn't use it all the time; as you said; 'Very, very, rare'; but it could happen, though. The essence of any D&D game is the interaction of players assuming imaginary roles to explore the world the referee has provided or created for them, but you are correct when you suggest that it's not a genre specific game. Whether you use gunpowder, rad pistols, broadswords or katannas, as always, it's your game; play it the way you want to, and that is the spirit of D&D. China Mieville's New Crozubon novels are similar: they're set in a very modern world but for some reason there's still no actual *guns*. Incorrect. Jack-Half-A-Prayer uses a repeating pistol, and Shadrach the Adventurer has an ensorcelled flintlock pistol. Multiple other characters have guns of one form or another. Did Conan employ a gun? No, but Solomon Kane certainly did, as well as Dark Agnes and several other historical REH characters. Leigh Brackett's John Eric Stark, Outlaw of Mars, also carried a gun, although he didn't use it very often. Guns are out there, but they have to be treated as no better or worse than any other form of weapon - they have strengths, and they have limitations. Secondly, if anyone developed something like that, mages would rush to destroy all traces of it, just to keep themselves on top. The 'common people' shouldn't be able to equate a mage's power just by going out and buying a gun. That's actually the conceit of the GURPS fantasy setting, Yrth. An informal worldwide conspiracy of mages actively works to suppress gunpowder wherever it appears, for the precise reason that they appreciate how much they stand to lose.